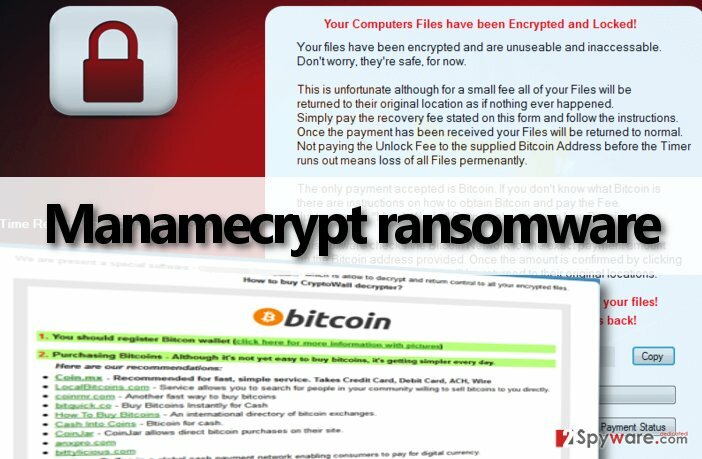 Manamecrypt ransomware uses sophisticated techniques to infiltrate computers and hide from its victims. Use Reimage to determine whether your system is infected and prevent the loss of your files. How does Manamecrypt spread and how you can prevent ransomware attack? A new computer virus has been released recently, and it is called Manamecrypt ransomware. It stands out from other ransomware variants because it uses a different technique to take victim’s files hostage. If the computer user accidentally installs Manamecrypt malware or if it gets installed by a Trojan horse, it will start to compress user’s files into .RAR archives and protects them with a password. Reportedly, Menamecrypt seeks to lock .jpg, .mp4, .psd, .mp3, .jpeg, .gif, and similar file types. Although Manamecrypt does not encrypt the files, however, the user loses access to them. After this virus scans the entire system and locks all target files, it triggers an application called “# DECRYPT MY FILES #” that explains what happened to the computer. It says “Your computers files have been encrypted and locked! Your files have been encrypted and are unuseable and inaccessable. Don’t worry, they’re safe, for now.” This application also explains that user can still recover the files by paying “a small fee.” It asks for 0.32277 Bitcoin, which is approximately 136 USD. Comparing to Locky, TeslaCrypt, or CryptoWall viruses, the ransom cost is actually really quite low. Usually, ransomware viruses command victims to pay around 500 USD or even more money to set victim’s files free. However, we still do recommend you to pay up because paying the ransom provides material support to cyber criminals. Also, you cannot be sure that frauds are actually going to give the password required to unlock these .RAR archives. However, later we will explain how you can decrypt your files without paying the ransom. Now you should take care of the virus and remove Manamecrypt related files from your system. The easiest way to do it is to employ an automatic malware removal tool – Reimage. Research has shown that the majority of ransom-demanding viruses spread via spam emails. Therefore, you should stay away from suspicious emails sent from people you are unfamiliar with. Always carefully inspect the email address of the sender, because many cyber criminals tend to create fake “official” emails and pretend to be representatives of well-known companies. If you have been infected with Manamecrypt, it can be a sign that you have a Trojan horse installed on your computer. Trojans are used to silently download malicious programs into the compromised computer and carry out other illegal activities. To make sure your computer is Trojan-free, you should scan it with a powerfulanti-malware software. Avoid clicking on suspicious clickable content online, especially on websites that are doubtfully reliable. Cyber criminals use the clickjacking technique to hide malicious links under buttons, pushy ads, and other clickable content. Clicking on such corrupted content can automatically download malicious files to your computer. If your PC has been infected with Manamecrypt ransomware, do not waste any time and get rid of it. Proceed to read the article on page 2 to find Manamecrypt removal guide as well as instructions how to unlock your files. Although Manamecrypt is a malicious computer threat, computer experts managed to crack the code that is required to unlock .RAR archives. NOTE! You must remove Manamecrypt virus before you try to unlock your files. For that, you can use an automatic malware removal tool, but if you wish, you can try to uninstall it manually (the instructions for that are given below the article). However, if you are an inexperienced PC user, you should opt for the automatic removal technique. If you have already taken care of Manamecrypt ransomware, try this technique – enter a code that consists of the name of .RAR file and the name of the computer. Please remember that cyber criminals update their malicious programs and patch their flaws, so if you are not able to decrypt your files using that combination, it means that you have installed an updated version of Manamecrypt malware. Log in to your infected account and start the browser. Download Reimage or other legitimate anti-spyware program. Update it before a full system scan and remove malicious files that belong to your ransomware and complete Manamecrypt removal. When a new window shows up, click Next and select your restore point that is prior the infiltration of Manamecrypt. After doing that, click Next. Once you restore your system to a previous date, download and scan your computer with Reimage and make sure that Manamecrypt removal is performed successfully. This entry was posted on 2016-04-13 at 23:15 and is filed under Ransomware, Viruses. You can quickly scan the QR code with your mobile device and have Manamecrypt virus manual removal instructions right in your pocket. 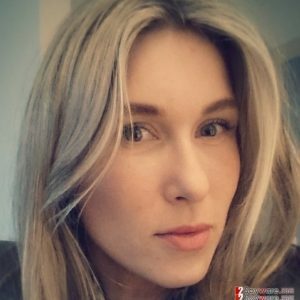 How did you remove Manamecrypt virus?